Or rather to this blog. And to its faithful readers. 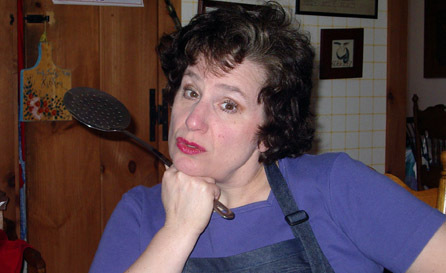 On September 3, 2008, In Our Grandmothers’ Kitchens first appeared on the internet. I thought the blog might serve as my passport to fame. It hasn’t quite done that …. yet. It has attracted a moderate following, however, and it has given me a forum in which to develop some of my favorite ideas and recipes. My most popular posts have been the ones about TV and Film History (particularly anything to do with “I Love Lucy”! 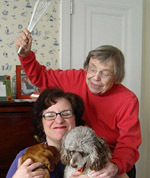 ), followed by those that dwell on two of my favorite foods, rhubarb and asparagus. A quickly rising post that will probably be number one soon is one I wrote shortly after starting the blog, about the poignant “September Song.” Sometime in the past few months someone inserted a link to this post into the Wikipedia entry for the song … and so people wander over every day to look at it. It doesn’t offer a recipe, but it does offer food for thought. In the coming year, I hope to use some of my blog posts in my next book. And I hope my audience will continue to grow. Please let me know what you like about the blog, what you don’t like, and what you’d like to see me do! In case you haven’t been following me from the start, I’m reprinting my very first post here. I hope to make the tasty scones again today—and to contemplate the universe, something we all need to do from time to time. As I contemplate, I’ll enjoy this (almost) autumnal anniversary. It’s fitting that the Jewish New Year falls in September, a month in which it seems natural to look both backward and forward. Thank you all for reading…. So said the late astronomer Carl Sagan on the PBS television series Cosmos. Sagan was one of the great writers of popular science for a reason. He knew how to phrase complicated truths about human existence in down-to-earth ways. To him, of course, the important noun in his sentence was the universe. To me (because I’m an ordinary person and a cook), it’s the apple pie. I love to cook—but I can’t imagine how anyone ever invented our most basic recipes: a simple cake, a loaf of bread, a scrambled egg, a pie. To my mind those breakthroughs are as mystifying as thinking up relativity or quantum theory. I’m glad I don’t have to come up with them myself. I’m content with tweaking traditional folk recipes and asking my neighbors to share the formulas for their own culinary triumphs. Nevertheless, I do know that very time we cook or bake we’re using science and recreating the universe in numerous ways. Even though I managed to avoid taking chemistry in high school and college, I use its magical processes every day to create meals for family and friends. When I follow a recipe or consider a specific food, the neurons (or whatever the heck does the work) in my brain conjure up the person who first introduced me to that flavor. And of course when cooking I create something new out of unrelated matter—my own personal big bang. 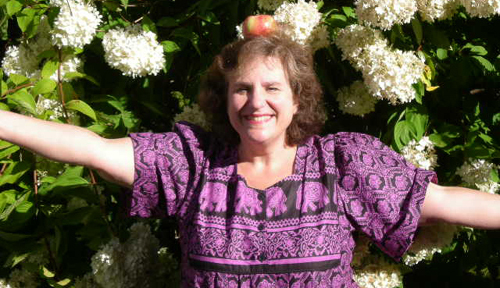 Apples are all around us at this time of year, embodying the coming autumn with that season’s key characteristics. They are cool. They are colorful. They are crisp. Looking down at us from trees or up at us from a basket, they evoke wonder and laughter, just like the universe. They are comforting, nutritious, and versatile—capable of waxing sweet or sour (again like the universe), depending on their use. My dog finds them on the road and uses them as balls, illustrating gravity (wouldn’t that old apple lover Isaac Newton be proud?) by propelling them down the street and running to retrieve them. 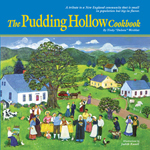 I’ll be posting some apple recipes here as time goes by. Luckily, none of them actually takes 13 billion years to make—unless you, like Sagan, like to consider the very, very big picture. This simple recipe never fails to please. I made it almost weekly when I worked as the demo cook at Bloomingdale’s in Tysons Corner, Virginia. It’s also delightful with dried cranberries instead of the apple. Preheat the oven to 350 degrees and grease 2 baking sheets. Combine the sugar, flour, baking powder, baking soda, salt, and cinnamon. Cut in the butter, but be careful not to overmix. Stir the apple pieces into this mixture. In a separate bowl, combine the egg, buttermilk, and vanilla. Add the apple mixture and blend briefly. Drop the batter in clumps onto the baking sheets. You may either make large scones (you’ll end up with 6 to 8 of them) or smallish ones (12 to 16). Sprinkle additional sugar on top for added flavor and crunch. Bake for 18 to 25 minutes. Makes 6 to 16 scones, depending on size. Author and chef Michael Ruhlman recently wrote a post explaining why he cooks. He went on to challenge other food bloggers to do the same. Never one to be shy about expressing myself, I’m joining the fray. Most of these points have been made individually as I’ve cooked and written here In Our Grandmothers’ Kitchens. I thought I’d summarize them today. 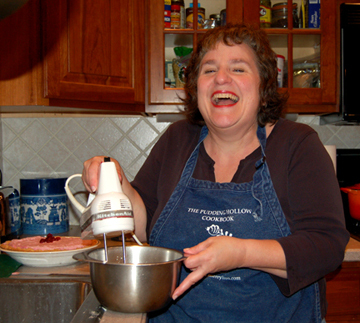 First, I cook (and write about food) because it gives me an integrated life. It merges the private and the public. Nothing could be more personal than feeding ourselves and our families. Yet cooking is at its best a social enterprise. It also holistically touches simultaneously on the intellectual, the physical, and the emotional. Second, I cook because I was brought up to do so. My family generally prepared meals instead of buying them precooked. And when my mother wanted to get to know someone new, or to maintain a friendship she cherished, she hosted a dinner party. In my childhood home food symbolized family, friendship, and love. It symbolizes them for me today. That tradition leads me to my paramount reason for cooking. I cook because cooking helps me reach out to other people. 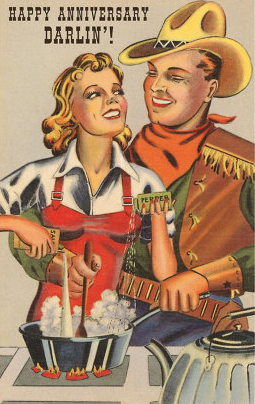 Cooking is a wonderful shared endeavor, one that spans the generations. My nephew Michael is an excellent mixer and egg breaker. At 91 my mother can no longer read very well and is a lot less mobile than she used to be, but she still loves to sift or stir or just set the table. Cooking with me makes her feel useful and alive in a way that few activities can at this point in her life. And it brings us closer together. Cooking obviously touches those whom I feed as well as those with whom I cook. It also helps me to touch those whose recipes and cooking styles I use, in the past or in the present. With a wooden spoon in one hand and a pot in the other, I can stand beside my grandmother, a neighbor, a school friend from India, or an author whose works I admire. Finally, I cook because I am interested in many different fields of study. I know it sometimes seems like a stretch to my readers when I link a recipe to film or literature or television or American history. I thank you for your patience and warn you that I’m going to keep on stretching. I love the way in which cooking and writing about food can be tied to just about anything. Cooking thus becomes a way for me to stay sane, to keep in touch with the people I love and want to know better, and to learn about topics that stir my passions. It nourishes me in many ways—and it helps me make friends and learn new things every day. Mentioning learning new things leads me to today’s recipe. 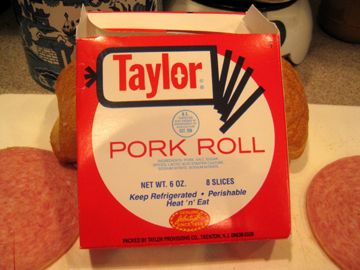 If you’re from New Jersey, you know all about Taylor Pork Roll! 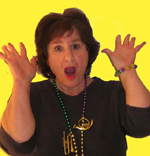 http://tinyurl.com/yjjucme. Now I was born in New Jersey, and I spend a lot of time visiting my mother’s house there. And I had never heard of this stuff before I saw Olver’s tweet. According to Olver’s post, Taylor Pork Roll is a processed pork product—a cross between spam and summer sausage—first made in the early 20th century by a company founded by John Taylor of Trenton, New Jersey. I did a quick internet search, and it turns out that many folks from New Jersey are indeed completely gaga about this product. One company makes a living sending the Pork Roll and similar products to members of the Jersey diaspora in other states; grateful customers have written to its web site sharing their fond memories of Taylor Pork Roll. I peered into the packet, and one of the store employees asked me what I was looking for. When I informed him that I had never seen Taylor Pork Roll before he widened his eyes. “Where are YOU from?” he asked. Obviously, I will have to ask another state to issue me a birth certificate. The most popular use for Taylor Pork Roll is apparently the “Jersey Sandwich” a.k.a. the “Jersey Breakfast Sandwich” a.k.a. the “Triple Bypass.” This is a sandwich made of warmed Taylor Pork Roll, a fried egg, and melted cheese on a bun. I’m pretty sure the roll should be a Kaiser, but I had only ciabatta rolls in the house. And the cheese should definitely be American, but I substituted cheddar. 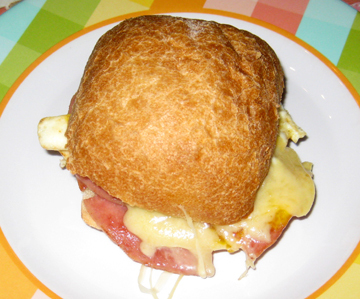 Next time, I think I would use thinner bread and perhaps leave out one ingredient—combine the Pork Roll with eggs, or make a grilled cheese sandwich with pork roll. Both my mother and I found the sandwich tasty (who could resist all that fat? ), but it was too heavy to finish. 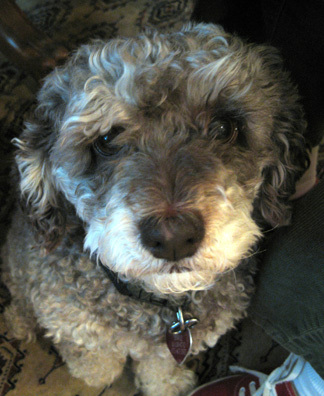 Truffle was happy to help eat some of the leftovers, of course. Preheat the broiler. Place aluminum foil on a flat, ovenproof pan. Split the roll in two and butter both inside pieces lightly. Place the slices on the foil-covered pan. In a frying pan over medium heat cook the pork pieces until they are warm and lightly browned on both sides. Remove them and set them aside. 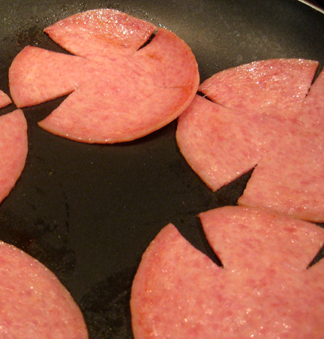 Place the slices of Pork Roll on the bottom piece of the roll. Place the egg on top, and cover it with the cheese. Pop the roll under the broiler and cook until the cheese has just melted. Cover the sandwich and serve immediately. Makes 1 very filling sandwich. Truffle is still hoping for more Taylor Pork Roll! Colonial Williamsburg stages a Grand Illumination early each December. This weekend-long celebration includes bonfires, fireworks, and candlelit dinners. Visitors amble along the streets of the town, sipping mulled cider and enjoying the gift of light in this season of growing darkness. Four years ago, the historical society in my small western-Massachusetts hamlet inaugurated its own Illumination tradition. On a Sunday evening in December, members and friends of the Sons and Daughters of Hawley gather in the Hawley Meetinghouse, the former East Hawley Church. This Little Illumination doesn’t pack the punch of the one at Colonial Williamsburg, where the weekend draws the season’s largest crowds. 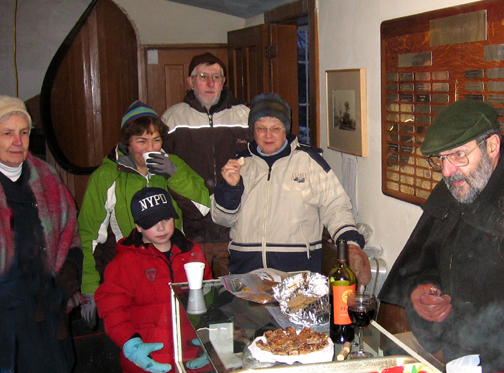 This year on December 7 a whopping 12 people showed up at the old church in Hawley. 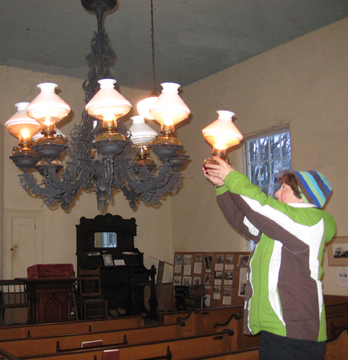 The Meetinghouse has no heat so activities were necessarily brief. Those gathered decorated an outdoor tree with bird treats. They lit the church’s elderly chandelier with lamp oil. They placed battery-operated candles in each window. 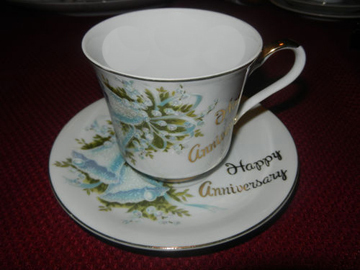 They sipped a bit of warm cider, hot chocolate, or wine. They sang a few carols (a cappella since no one wanted to lay fingers on the frigid piano keys). They then swiftly departed for home. Nevertheless, the two Illuminations—northern and southern, Little and Grand—have a lot in common. They both warm the heart if not the body. They both give their participants the feeling of living in the past, if only fleetingly. Standing in the Meetinghouse as it grew dark outside, enjoying the glimmering lights, we Illuminators felt as though we had been transported by magic into another era. Above all, both Illuminations celebrate light. Light is meaningful on a number of levels at this time of year. As we learned last week when many of us in New England lost our electricity, light is perhaps most highly valued when we don’t have it. In our complicated homes, light is synonymous with power—the literal power to talk on our electric telephones, type on our electric keyboards, cook on our increasingly (alas!) electric stoves. Illumination and light are also symbols. Illumination was the term used in the Middle Ages for the creation of books that were transcribed and decorated, then passed on to posterity, spreading knowledge. Illumination also means understanding, figurative light that shines on some idea. Light can stand for thought (the hackneyed light bulb that shouts “idea” in cartoons). It can stand for deity (the burning bush of God in the Old Testament). Above all, light stands for hope. Christmas falls at this time of year not because Jesus was necessarily born in late December but because he is viewed as a symbol of hope, of light in the darkness. The December festivals of Hanukkah and Kwanzaa also focus on light, burning candles that celebrate a variety of positive attributes but hope above all. Light is a central theme of the musical Big River, which won several Tony Awards when it debuted on Broadway in 1985. Big River is an adaptation of what may be the most American of novels, The Adventures of Huckleberry Finn. Young Huck’s signature song in the show, “Waiting for the Light to Shine,” sums up much of his character just as Mark Twain’s novel summed up much of the American character. It is at once cynical and hopeful, kinetic and focused, pragmatic and idealistic. At this time of year, we are all waiting for the light to shine. We find that light whenever we celebrate a holiday, whenever we gather with neighbors to sing or talk or feed the birds, whenever we start a fire and blow on it ever so gently to encourage the flames to rise. I share my light by cooking; my most frequent holiday gifts are edible. In the posts immediately below this one I’m highlighting a few of the nibbles I’ll be giving out this year. I hope they bring a little light and a little fun to readers. Happy solstice! To hear my fellow New Englander Jason Brook sing “Waiting for the Light to Shine,” visit this link. Hawley Illuminators work to stay warm in the old church. Visit THESE LINKS are a couple of cookie recipes to help you celebrate your own illumination, one from me and one from Illumination regular Melanie Poudrieru.